It’s Mixology Monday time again! 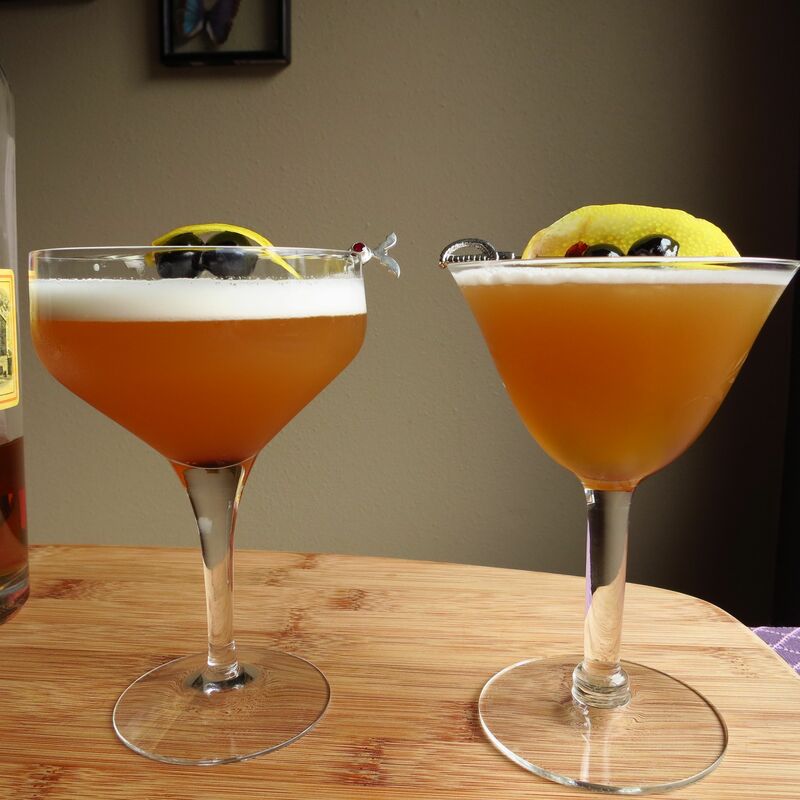 This month’s theme, Sours, comes from Andrea over at Ginhound. Taking Andrea’s suggestion, we decided to experiment with what souring agent we used. Awhile back, we picked up some Acid Phosphate and some Lactart. 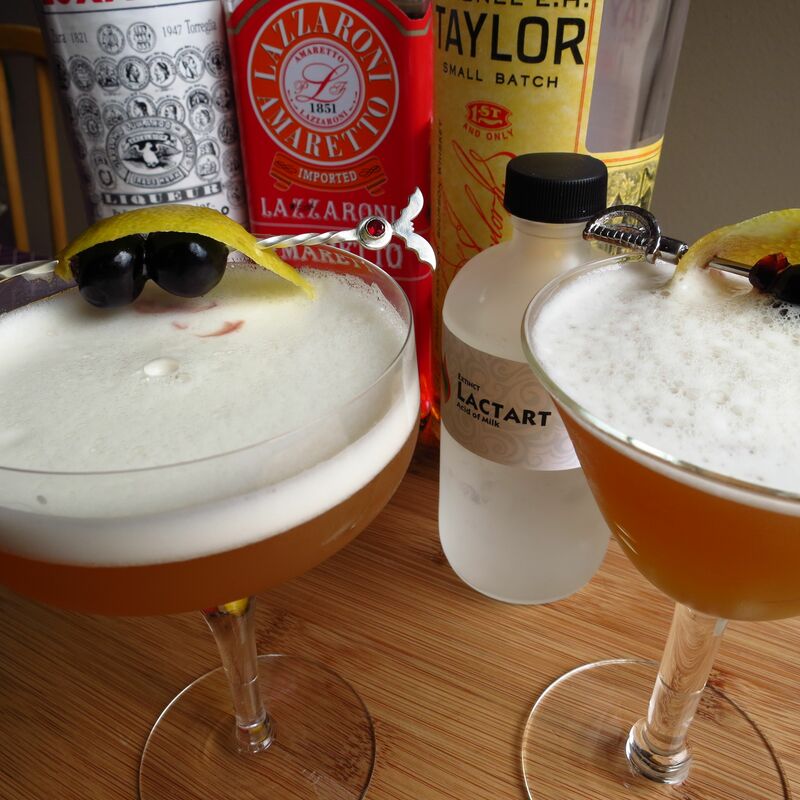 After tasting both, we decided to make an Amaretto Sour using Lactart and compare that against the original recipe using lemon to see how the choice affected the flavor. Things got complicated from there 😉 Read on to find out what we determined. We decided to start off by trying a classic Amaretto Sour recipe. Dry shake all ingredients to get a nice foam. Shake with ice. Strain into a glass. Garnish with a cherry and a lemon twist. Nose: Almond and a little bit of lemon. Palate: Very sweet! Sweet almond and lemon to start, then faint bitter almond on the mid-palate. Long sweet finish with subtle bourbon notes. Bitter almond aftertaste. Fairly one note compared to the others. We liked this, but it was a little too one note and a lot too sweet for us. So we decided to experiment more with the base sour recipe and add maraschino into the mix. We felt the the bitter almond notes of the maraschino would pair well with the amaretto, and the added complexity would balance the sweetness. Nose: Strong lemon and almond, little bit of cherry and oak. Palate: Sweet still. Good foam with a nice round mouth feel. Sweet lemon and almond at the start. Then almond and bitter cherry notes from the maraschino. Bourbon underpins things but doesn’t stand out. Bitter sweet almond and cherry finish. This recipe tasted pretty good and had a great mouth feel and creamy foam, but was still a bit too sweet. So we tried again, this time upping the lemon juice and dropping the added simple syrup. Nose: Same as the first Booze Nerds remix. Palate: Flavor is similar to the first Booze Nerds remix, but better balanced and not as sweet, definitely hitting the profile we want. Sadly, the mouth feel is not as round. We loved the flavor on this one, but missed the improved mouth feel that the additional sugar provided. We decided to try one more iteration, this time adding gum arabic syrup to add texture and viscosity to replace what was lost when we removed the simple syrup. Palate: The flavor was the same as our second remix, nicely balanced between sweet and tart, with all ingredients showing clearly. This time though, we recaptured the really nice mouth feel. Came out rich and creamy with a very nice foam. Perfect! Finally, we had a base Amaretto Sour recipe that we were happy with. Now, on to make a version with Lactart and see how that compares. Palate: Pretty good balance. Almond & sour cherry on the front, sweet cherry and bourbon on the mid-palate. Almond & caramel-y notes on the finish. Sour on the end with some dry chalkiness. Decent foam though not as much as with lemon juice. So makes an OK if not perfect substitute in a sour. Our findings are that the lactart drink has good balance and flavor overall, but having the lemon out of the mix made the drink less interesting. Also, having to up the amount of lactart to replace all of the lemon juice added a slightly unpleasant chalkiness to the drink. We would drink it again, but only if we were out of lemons 😉 Our recommended version is definitely our perfected recipe, which provides the sweet-tart balance and creamy foam that are hallmarks of a good sour. 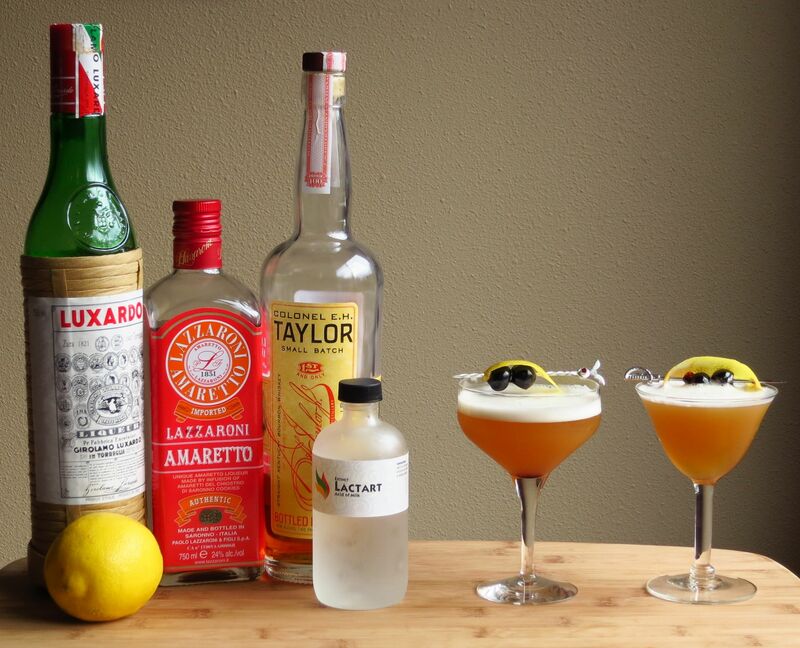 This entry was posted in amaretto, bourbon, maraschino, Mixology Monday and tagged colonel taylor bourbon, lactart, lazzaroni amaretto, luxardo maraschino, Mixology Monday. Bookmark the permalink.